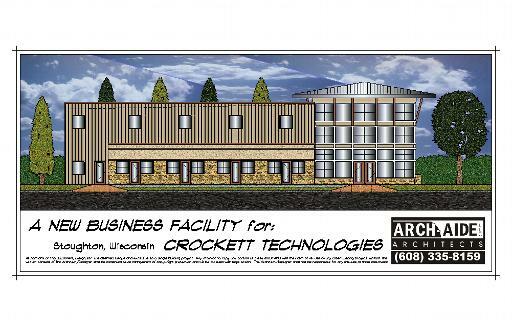 A Brand New business facility for a machine component designer & manufacturer to be located in the Stoughton, WI Industrial Park. ARCH-AIDE, LLC will serve as the Design Architect and Builder for this State of the Art facility. THE HODY BAR & GRILL: Middleton, WI. An always lively establishment with a Sport Bar atmosphere located in the heart of Downtown Middleton, WI. Key features of this facility include; a generous Commons Area with a portable stage area for live entertainment, a fully equipped Food Preparation Area, two separate Game Rooms, and an elevator leading to a finished Banquet Hall in the Lower Level. VAN HORN HYUNDAI: Fond Du Lac, WI. A new car dealership located in a newer development at the east edge of town. Features include a Highly Modern service facility which uses the latest diagnostic equipment available to 'trouble-shoot' automotive problems. A straight forward approach to the architecture was established which extends from the exterior to the interior. The showroom boasts a polished patterned terrazzo floor that is enhanced by crisp, simple interior details and suttle hints of natural wood. 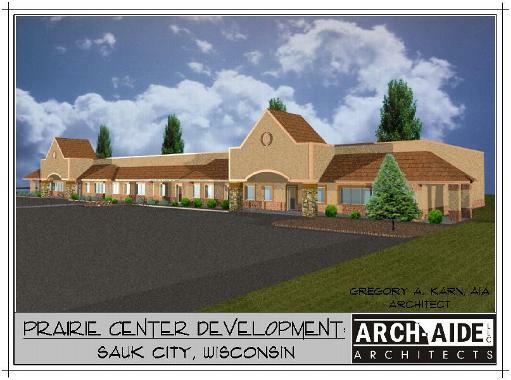 PRAIRIE CENTER: Sauk City, WI. Over 6000 SQ. FT. of retail space located on a major thoroughfare at the west end of town. Natural exterior colors were selected because the backdrop for this building is a beautiful tree-line of conifers and hardwoods. This retail facility plays host to a major locally owned pharmacy and a chiropractic clinic as anchor tenants.